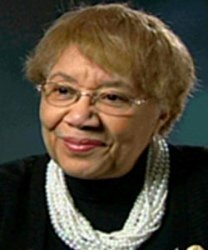 First African American female named by Governor Rod Biagojevich and confirmed by the Illinois Senate to a six year term on the University of Illinois Board of Trustees and the Illinois Board of Higher Education (2003). As a member of the Board, this pioneering soror re-stimulated the debate over the use of "Chief Illinois" as the university's mascot (2003). Due to her efforts, the image was retired (March 2007).